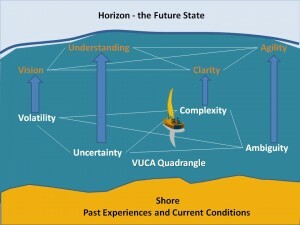 To apply the learning of VUCA ∞ VUCA Prime I draw a visual metaphor of my situation. I have limited drawing skills so I need something that is simple and provides just enough structure to guide my thinking. I start by establishing context, in this case the design for a cultural change program to create an intentional corporate culture. The context also establishes the time frame; my horizon is 18 months out. Setting the context helps you “see” the system as well as the other systems that are linked to it. My system is a group of 150 people from within the organization coming together under a new charter, the integration of three sub-cultures. Next, look to the horizon. The horizon of the future is not your Vision, but rather a set of 3-4 plausible scenarios, each of which contains some version of your Vision. Like any set of scenarios my project is impacted by the whole environment in which the corporation operates. This step broadens my thinking, challenges my mindset, and surfaces unquestioned assumptions. My client is a nationwide corporation providing services to large mixed urban communities and businesses. My horizon includes: city center rejuvenation (or lack of), a range of joblessness (from little to significant), and varying adoption levels of new energy technologies (wind, solar, geothermal). This isn’t a formal scenario building exercise but more of a stage setting process, so we can understand what we are sailing into. In this example my horizon can be captured using a simple 2×2 matrix: continued urban decay to modest revitalization on one axis and high to low adoption of new energy technology on the other. 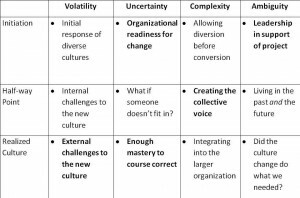 This produces four future scenarios and the intentional culture must be fully operational in each. 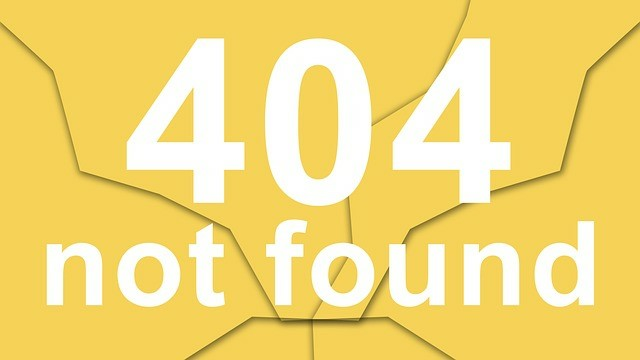 Over the next 18 months I will track which future is beginning to emerge and tailor my program appropriately. Now we need to consider the shore that we launch from. In this project three separate and distinct cultural units are being integrated. The conditions across the corporation are those of radical change – nationwide energy company, traditional corporate structure, and creative tension between old and new technology. We are launching from an immediate past and foreseeable future of unpredictable economic change and organizational turbulence; including the restructuring that brings these three groups together. I plan to sail a general course to the horizon. Depending on the VUCA winds, I will course correct as needed – tacking toward the VUCA Prime element that balances each challenge as it arises. To pressure test my program design, I divided the project into three phases: initiation, half-way point, and realized culture. 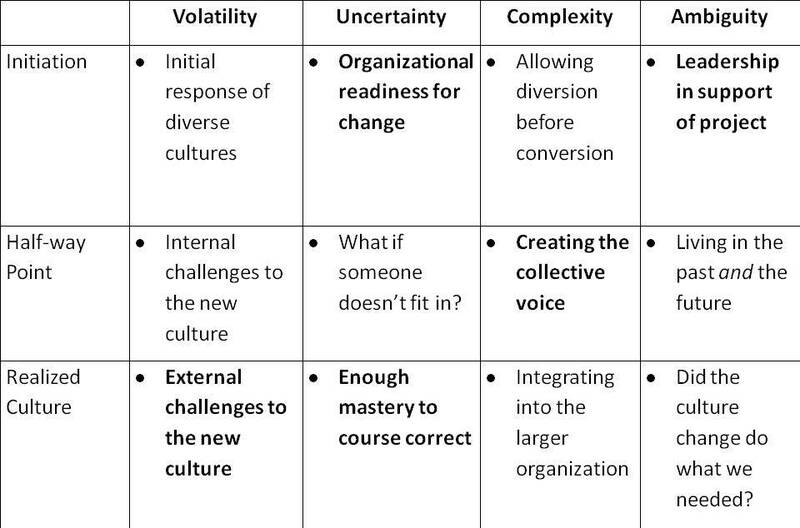 Using these I completed the following chart to help me think my way through the VUCA Quadrangle, which is one degree more dangerous than the Bermuda Triangle. I show one item in each column, there were actually many, and bold what I think are the most significant columns for each phase. Using my completed table I went back and added an assessment phase at the beginning to create more Understanding and a full day workshop at the half-way point to improve Clarity. While VUCA and VUCA Prime are concepts, they are also a mindset – a different way to perceive and react to situations. This is the benefit that military and corporate leaders are realizing from this approach. When you see the world as composed of four elements rather than one, turbulence, you have four actions you can take. Applying VUCA and VUCA Prime is not rocket science and it is useful as a way to think about the things you do every day as contributors and leaders. Start by observing the four elements when VUCA shows up. Which one predominates? Then tack in the direction of that VUCA Prime action and see what happens. Carol challenges leaders and their organizations to think differently about the world and how they can achieve their fullest potential in it. Her unique background unites business and biology, psychology and physics, bringing them into creative tension and generating tools and applications for all levels of the organization – from the C-Suite to the manufacturing floor. Carol has worked as an entrepreneur and an executive in Fortune 500 companies, always introducing fresh ideas that produce innovation and change, locally and organization-wide. She holds a degree in Psychology/Education, a Masters in Human Ecology/Interpersonal Relations, and a Doctorate in Veterinary Medicine.